I meet Robert Montgomery at Cob Gallery in London’s Camden, where just the previous night, he had celebrated the opening of his latest show ‘Hammersmith Poem and Love Letters to Kazimir Malevich’. It’s been a busy autumn for the artist and poet, who has also recently unveiled a series of public billboard poems which were shown in Shoreditch during Frieze week, and the latest addition to the Parasolstice – Winter Light series at Parasol Unit, his first light poem to be commissioned by a public institution in London. JETHRO TURNER – Can you explain the context of the show here? ROBERT MONTGOMERY – The context of the show comes from this public commission that I did for Hammersmith and Fulham town hall. Or more specifically, the Brutalist annex of the town hall, which has always been a subject of local controversy. It’s basically this little bit of High Brutalism, like a bit of the Barbican that’s been torn off and stuck on front of the Georgian facade of the old town hall. So it’s always been a subject of local debate between architectural traditionalists and modernists. Essentially, the texts sort of argue that Modernism is not a style, but a social movement, a continuation of the Humanist enlightenment that begins with the Renaissance. Then what Modernism ends up doing in Britain for example is becoming the backbone for this great social project in the 1940s that gives us the NHS, free public libraries, free university education. JETHRO TURNER – Is this the most explicitly didactic, political that you’ve ever been with your work? ROBERT MONTGOMERY – It’s the most that I’ve ever worked on one theme, and within a contemporary art perspective it’s an important debate too, because we got bored of the idea of Modernism, then we went into three decades of post-Duchampian irony, and a set a of post-Structuralist theory that talks about post-Modernism, which might in retrospect be a kind of red herring. JETHRO TURNER – So Modernism is an unfinished project? ROBERT MONTGOMERY – Yes. Because Modernism has to be constantly redefined. If you don’t, then you’re not refreshing your idealism for the times that you live in. And we need to have an idealistic, utopian edge to the avant-garde in art, architecture, social housing, social planning, ecological planning. There has to be a form of idealism, so I’m arguing for that. But from an art perspective, the funny, post-Duchampian art-about-art, the generation of artists like Maurizio Cattelan, Mike Kelly, Jeff Koons, seems like it’s suddenly a bit irrelevant in an age of ecological crisis. JETHRO TURNER – You’ve done a few big projects recently. ROBERT MONTGOMERY – I’ve been taking the texts from the Hammersmith project and making murals. So here’s a giant mural on the side of a university building in Aberdeen which is about three stories high. JETHRO TURNER – And then you did the Shoreditch billboards project. ROBERT MONTGOMERY – The Shoreditch billboards were the first time that I used multiple panels to make kind of extended graphic poems. JETHRO TURNER – I’m very interested in the punctuation and the typography, the marks you’re using in the text. That seems like something new for you too. ROBERT MONTGOMERY – I’ve been using those more and more as graphic devices to punctuate the lines. They also seem to evoke urgency, like the double arrowhead mark, which is actually stolen from the logo of the Accenture consulting firm. JETHRO TURNER – It’s also like the fast-forward symbol. ROBERT MONTGOMERY – Yeah it’s these misused punctuation marks. So the slash symbol is used as a line break. Or these black long lines on the keyboard. JETHRO TURNER – But unlike a fixed page size, you’re in control the size of the space, how big the canvas is. Yet you’re still using these line breaks as if it’s a fixed page. ROBERT MONTGOMERY – Totally. I like the idea of the poetry going over the page. I’ve been looking a lot at the Vorticist movement. The back of our building is the place where Wyndham Lewis published Blast Magazine in 1914. And when you look at an issue of Blast, the text comes off the page, like the whole magazine is one giant concrete poem. It’s a really amazing example of a British rewiring of Futurist graphics, but I think that there’s a real sense of sort of urgent hope in the way that Lewis uses graphics in that magazine. JETHRO TURNER – This work is poetry that stands alone, and is published in different ways as pamphlets and billboards, as well as the paintings. What can you do with the paintings that you can’t do in the other places? ROBERT MONTGOMERY – You can just be a little bit more sensual. I studied painting for my BA, and my MFA was drawing and painting. But I wasn’t making paintings because I had no good ideas for paintings. But then, the Malevich reference in the Hammersmith billboard is that between 1917 and 1925, he made four versions of the Black Square painting. So I kind of jumped off there and then started working along the lines of other Malevich compositions. JETHRO TURNER – You mention “idealistic utopianism” – how can we use poetry to get there? That’s one of the things that I think is very interesting about the public art commissions especially. On one level we’ve never been further away from a society that embraces poetry. Today, people’s exposure to different types of art has never been bigger, but poetry seems to just exist in advertising copy and hip-hop – in little chunks of the mainstream. ROBERT MONTGOMERY – I’ve definitely wanted to do that, to use the techniques and formats of advertising copy, and ask that to deal with poetry. It’s a challenge to constantly modernise the way you go about writing poetry. When I’m writing texts I consciously try to use the way we speak on social media, to use modern, idiomatic shortenings of words. I think you have to deal with the language of your time if you can. Then there’s lots of ironic things in terms of the dissemination of poetry and art on social media. JETHRO TURNER – The most popular poetry on social media is dire. ROBERT MONTGOMERY – Yeah. It’s kind of popular nonsense, kind of fridge magnet affirmations. And it’s all affirmations for the self. Telling people ‘you are great’. So it’s this complete reinforcement of individualism. Self love, self confidence. It’s quite frightening. JETHRO TURNER – You’ve had a kid. Has that changed how you think about how your poetry should operate out there in the world? 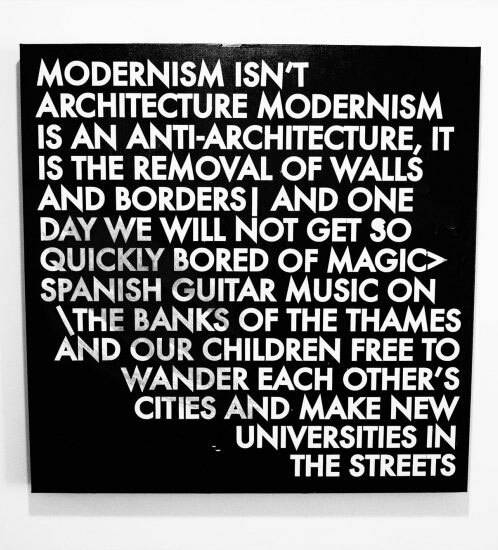 ROBERT MONTGOMERY – It’s interesting. I haven’t really thought about that consciously, but I think it has made me think more about the future. I’m trying to ‘future-think’ a bit more, instead of wallowing in the existential angst of the now. It’s also to do with having a kid and thinking: ‘do he and his generation have equal social opportunities to what my generation had?’. And I don’t think his generation does really. Which is probably part of the background to the thinking about Modernism. On view until November 25th, 2017 at COB Gallery, 205 Royal College St, NW1 0SG London. This entry was posted on 22 November, 2017 in homepage. Bookmark the permalink.